The best characters in stories are the ones who grow and develop throughout the story. The characters who are a little different at the end of the story than they were when we first met them. Cordelia Chase, Wesley Wyndham-Price, Anne Shirley, Kvothe, Harry Potter and crew, Emma Wodehouse (and by extension, Cher Horowitz), Egwene Al'vere, Matrim Cauthon. I'm sure you have your favorites to add to this list. I've been thinking lately about things I wish I could tell my junior high/early high school self. To be more comfortable in my own skin. To appreciate my true friends more, and to not spend so much time trying to catch the attention of "popular" kids. To be kinder to boys when things got weird, and to not put up with the mean girl behavior of one so-called best friend. But hopefully, I look a little different these days than that pretty typical adolescent girl. I'm working on a nice character arc, and hopefully it makes me a more interesting person. And instead of bemoaning things I can't change, I can share what I've learned. I can put my arm around the 8th grade girl struggling with a friendship that is diverging and say -- "you know what. It's okay. Be kind, be yourself, and be open to new friendships. It's okay to be a little weird, because there's someone else as weird as you who needs buddy too." So maybe I was a Gretchen with my own Regina George (who wasn't anywhere near that level, but that's another story). I can say with confidence that phase is long gone. And the journey isn't over. And I figure as long as my character keeps growing, it'll be a pretty interesting story. I'll be in good company at any rate. 1. Thursday night I was having trouble falling to sleep, and my mind starts writing this really great blog post. Of course, I don't get up and write anything down or just write up the post because I'm trying to be responsible and sleep before those munchkins wake up at 0-dark-thirty. Of course, that means the next day the idea is just kind of eluding me and any similar idea just sounds flat. Lesson learned. Who needs sleep, anyway? 2. Sometimes I feel guilty about my dependence on modern conveniences. My car, indoor plumbing/showers whenever I want them, disposable diapers (to be fair, I do part time cloth diaper. So I tell myself that I'm not completely dependent), air conditioning. This last one is really a source of more angst that it should be. I mean, we live in Houston for goodness' sake. South. Swamp. Subtropical climate. And I know people live (and lived for a good long while) in the South without AC, but usually it's important to have a house built for that (ours, is not). Anyway...I like feeling comfortable, so AC it is. But sometimes I just feel bad about that. 3. Camping. I'd really like to go camping this fall (summer camping is for the beach or a climate where it cools down at night. Sorry, but I need to be able to build a fire). But we'll see if it's in the cards. Not sure why it's on my mind now since summer's just begun, but there you have it. 5. I've realized that now that I have at least one or two nights a week where I could sit and knit/watch TV, that I'm at a loss for inspiration. I have people I would like to make things for, but nothing I'm excited about making. 6. I'm in the middle of reading Winter, by Marissa Meyer, and have a couple of audiobooks downloaded and waiting to go (fantasy, I'm pretty sure. I don't remember exactly). I'm not reading audiobooks at the speed I was at one point because I'm on a podcast kick. Namely: Wait, Wait, Don't Tell Me (an old favorite) and Happy Hour with Jamie Ivey. Happy Hour is a new find, and I'm digging it. 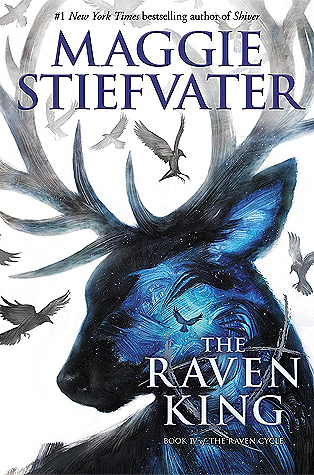 The Raven King is the fourth and final book in Maggie Stiefvater's Raven Cycle. Beginning with Raven Boys and on through The Dream Thieves and Blue Lily, Lily Blue, Steifvater tells us a story about magic, quests, friendship, family, destiny, love, sacrifice, and time. It's a wonderful story, and more than any of her books that I've read, it's clear that this story is the one Maggie's held in her mind and heart and soul for a long time (I think she said she started writing this story maybe 20 years ago?). It's written in Maggie's characteristically artistic style, simultaneously dreamlike and vivid and concrete. The story is layered -- there's a bit of epic quality to it, as one might expect when one of the main characters is on a lifelong quest to find a dead king along a magical superhighway. When one of the characters is fated to kill her true love with a kiss, and another is fated to die within a year. Yet, the story also zooms in close. It's about friends and family and small moments. About thinking you know something, and having your whole outlook on life turned on its head. The characters come to life, and you have to include Virginia as one of the characters. The mountains and forests and roads are a living, breathing part of the story. So. The Raven King. It was a satisfying ending, in the bittersweet way that the best series end. Meaning, you're left feeling like loose ends are fairly well tied, and yet there is life being lived beyond the final page. It's not a "and they all lived happily ever after" ending. Because there's clearly some ever after happening after this one story finished. But I love feeling like my friends are continuing on. My only real "complaint" about the final book is that I wanted more. More Gansey, more Blue, more Maura. But if that's the worst thing about it, then I can't complain. Bottom line, I love this series. And you'll mostly get fangirl-style gushing from me. I just finished a rewatch of the show Friday Night Lights. I really love that show. Inspired by the book of the same title, on the surface it's a show about Texas high school football. But it's really about relationships, family, friendship, love, growing up, dreaming, striving. It's about the complicated relationship we often have with the place we're from. It's about Texas. And yes, it's about football. Is it perfect? Of course not (see: Season 2). But is it good storytelling? Yes, one thousand times. 3. It's all about the conversation. Keep the lines of communication open and be willing to listen. 4. When you're proud...say it, show it. 6. You have to put in the work from the very beginning. Because then you can remind them to "be the person I raised you to be." 7. Be there. All the time. Let them go when it's time, but always be there when they need you. 8. And if you're parenting with a partner....love each other. And remember...because it's good advice for football and it's good advice for life: clear eyes, full hearts, can't lose.